In good condition, just has 3 small spots near pocket (see photos). Button Down. NEW WOMEN'S WEATHERPROOF 32 DEGREES ULTRA LIGHT DUCK DOWN SOFT SHELL JACKET! Weatherproof Jacket 1948 Gray Hooded Sherpa-lined Snap Pockets Size Medium. Warm & cozy! 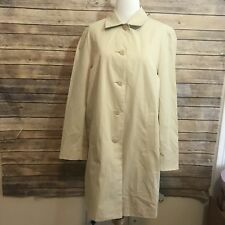 Women's Size Medium Weatherproof Brown Lined Button Up Coat Cute! Olive green coat made of polyester and nylon fabric has a brown faux leather trim, pockets and full zip front. 26" length. Weatherproof Womens Quilted Hooded Long Coat Jacket Olive Green M Medium NEW! 100% Authentic Weatherproof. These are my photos of the actual coat. Beautiful color and style. Style : Windbreaker. Athletic Apparel. Baby & Toddler Clothing. Baby Accessories. Dress Shirts. Style : Basic Jacket. Features : Water Resistant. MPN : Does Not Apply. Faux Fir Lining for extra warmth. Shell: 100% Polyester │ Lining: 100% Polyester │Fill 100% Polyester. This is a water resistant a line, button front topper jacket. It has a detachable hood, along with a trendy neutral gingham printed lining. Machine Wash. A line shape. Button closure. The jacket is Pre-Owned and in good condition. Color: Light Green. Length from shoulder to base: 25 1/2". Material: 85% Polyester and 15% Nylon. Zip-Front stand knit (Ribbed Collar). Shell: 100% Polyester. Fill: 60% Down 40% Feathers. Avoid using abbreviations and acronyms whenever possible. Terrific Weatherproof Wind jacket. Concealed hood in collar. Part of a large lot of salesman's sample I was able to get from a friend of mine who deals in this stuff. Cute is this faux fur /quilted reversible vest by Weatherproof. Chest armpit to armpit 20" (all around 40"). Length from shoulder seam to bottom 24". Two hand pockets that zip. Removable hood. Color is Scuba Blue. New never worn. No need to sacrifice style due to bad weather. Removeable hood and zippered side pockets. COLOR: Browns faux fox fur and reverses to black. Nice quality. CONTENT: 100% man made fibers, polyester, machine wash. Deep jersey lined side pockets. Length: 27". 60% Cotton 40% Polyester.